In an article from The New York Times, it describes how the icefish got its transparent blood and see through skull basically through "genome" hacking. At first, a Norwegian scientist figured out the species doesn't make red blood cells or hemoglobin that carry oxygen through the body. This works for the icefish because red blood freezes and is harder to pump throughout the body. It's acquired by part of adult genomes being dedicated to creating "ice-preventing proteins in shell like casings that surround fish embryos. A developmental biologist, John Postlethwaite, discovered the fish developed supersized gills and lost its scales to enable absorption of the waters oxygen through the skin. 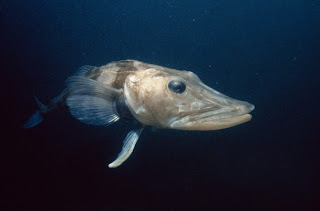 The icefish has also accumulated lipids that help the fish float in water along with floppy bones that are less mineralized allowing it to rise in the water column to feed on krill that aren't found near the sea floor. The research team is still working to understand how the adaptations of bone density can be reflected in the icefish genome which may lead to a better understanding why/how humans lose bone density and develop osteoporosis with age. How the icefish lives with severe anemia may also help with the reason why humans can't. Dr. Postlethwaite calls this species "evolutionary mutant models" due to their genomes being able to explain traits. Although extremely cool, I still don't trust things in the ocean. If they are able to apply the adaptation of the ice fish's bone density to human development of osteoporosis, that would probably be the latest fad at all the retirement homes.